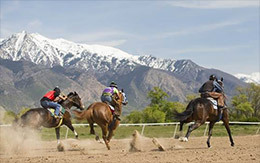 Weber Downs in Ogden, Utah will host trials for the Golden Spike Futurity and the Jake Kapp Maiden Frolic on Saturday. OGDEN, UT—APRIL 10, 2019—A total of 51 2-year-olds has been entered in Saturday’s 300-yard Golden Spike Futurity trials, as Weber Downs opens the 2019 Intermountain region racing season with a 13-race card. Post time for the first race is set for 12 p.m. (MDT). Only one of the juveniles entered in the Golden Spike trials -- Rosa Urquidi’s Wagonfullofdarlings -- has made a previous start. A Colorado-bred son of the Pyc Paint Your Wagon stallion Wagon Tales, Wagonfullofdarlings made his debut with a third-place finish in a 300-yard Oklahoma Futurity (G2) trial at Remington Park on March 9. Wagonfullofdarlings is trained by Roberto Trejo and will be ridden by Ramiro H. Garcia from post 6 in the third of eight trials. The fastest qualifiers from Saturday’s trials will meet in the April 27, $70,000-est. Golden Spike Futurity final. Saturday’s Weber Downs program also includes five 350-yard Jake Kapp Maiden Frolic (not an official stakes) trials.